Last week, we covered the re-footing method from Weldon’s Practical Stocking Knitter. This week, we’re taking a look at 9 sock heel types covered in the same collection. Isn’t this chart of Victorian heel types fascinating?? Not to mention decorative—I printed it out and hung it on my bulletin board over my yarn stash. Now, take a closer look at these heels. Are they all that different from each other? Are these heel techniques that sock knitters use today? I started to dig into the instructions for each of these heels, as spelled out in Weldon’s Practical Stocking Knitter, First & Second Series, and the very first heel is already a quirky little thing in my book. 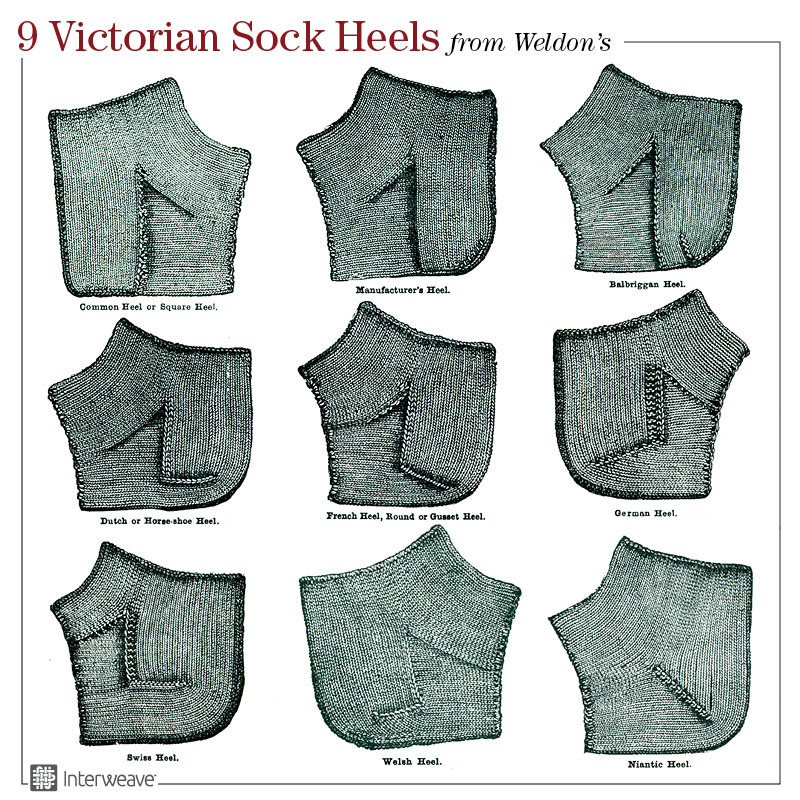 Weldon’s calls the first heel (top left of chart) the “Common Heel or Square Heel.” Well, this heel requires seaming the bottom of the heel, which is not a method I ever used in either the 20th or 21st centuries. I will explain here, in modern terms, how to work the “common heel,” and please let me know—have you ever worked a sock heel like this? Cast on and work a top-down sock leg. When you’re ready for the heel, continue over just the heel stitches, working in stockinette stitch and slipping the first stitch of each row. When the heel flap measures about 3”—“if an ordinary-sized stocking” according to the directions—you bind off the heel stitches. Then fold the bound-off edge in half against itself, with right sides facing out, and sew the edge together, creating a seam at the bottom of the heel and forcing the heel flap into a permanently folded state. Now for the gusset! With right facing and beginning at the corner of the instep and working down toward the heel seam, pick up and knit stitches evenly down the edge of the heel flap (1 stitch per slipped selvedge stitch), then at the heel seam, turn, pick up and knit along the second edge of heel flap, ending at the second instep corner. Return to working all stitches in the round, including instep stitches, and decrease gusset stitches at corners on each round until you have returned to the leg stitch count. 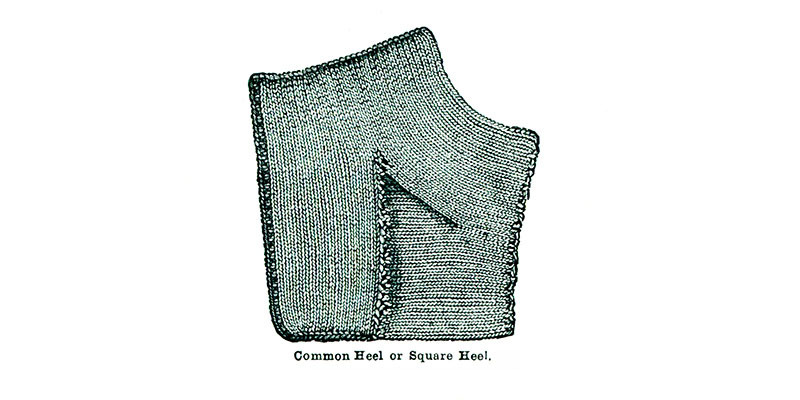 Now, having that seam on the bottom of the foot, and the pinching shape of the folded flap, do not strike me as ideal sock elements, but it must wear all right if those practical sock-knitting Victorians considered this their “common heel.” But perhaps they meant common in the derogatory sense, rather than “popular”? I don’t think I can judge a heel until I try it! But I’d much rather hear from some knitters who have tried it themselves, so please shoot me a note at knits@interweave.com if you’ve ever worked a common heel in this way. Check out all the heel techniques shown above in Weldon’s Practical Stocking Knitter, First & Second Series. They are a fascinating bit of knitting history.